What can innovators learn from the Chatham House Rule? — Think. Plan. Thrive. What is the rule and how does it work? The Chatham House Rule is about protecting people, not information. It states that comments made during a conference or meeting cannot be attributed to anyone present after the meeting has ended. Participants are free to use any information shared during a meeting but must not reveal the identity or affiliation of anyone in the room. The Rule has become a global standard and is often invoked at meetings to enable commercial or political information to be shared, promoting free discussion. It allows participants to share information and express views that may not be aligned with their organisation, while maintaining anonymity. I have experienced a variety of different forms of this rule, implemented in collaborate ideation sessions, debates and conferences over the past year. It has proved an incredibly powerful tool for empowering and enabling participants in a number of ways. Why is this interesting for innovation? This is just a simple agreement between people in a room. But it can facilitate a set of behaviours that contribute to building the right environment for innovative thinking. In order to uncover truly meaningful insight it’s important that people feel comfortable speaking honestly and openly. As a participant in any group, the knowledge that you cannot be blamed or judged outside the room for your perspective allows for much more insightful discussion or debate. IDEO are the collaboration champions. They have built models around it not only for innovating within their own business, but with other sectors and disciplines to drive business and social innovation too. Too often people attend workshops, conferences, ‘hackathons’ or debates, with an agenda that doesn’t sit directly in line with the objectives of the day or session. Whether this is due to having an organisational view to represent, or an individual career or networking goal to meet, it will often mean that outcomes fall short of their potential. The Rule encourages people to be present and to be themselves-by making them an anonymous voice within a team. 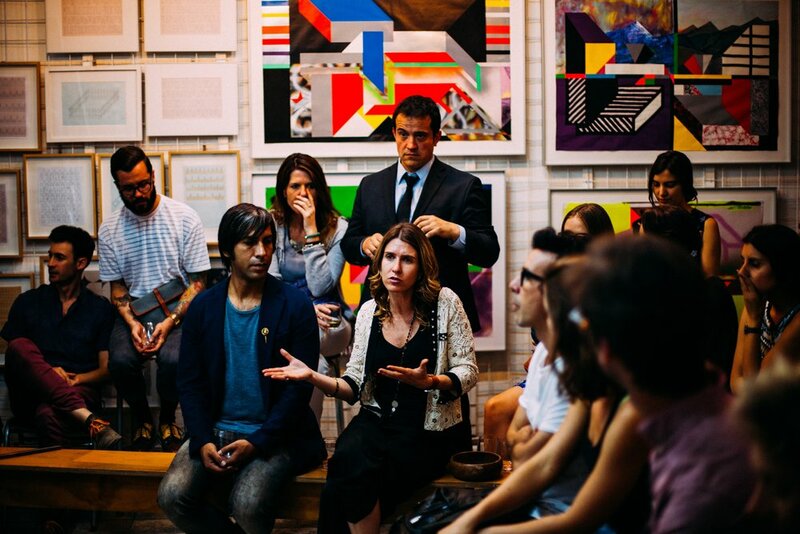 Culturevist are absolute experts at this — facilitating highly-engaged discussion and debate that is an incredible learning experience for all. Don’t miss their events! All of us — entrepreneurs included — constantly encounter communication barriers as a result of hierarchy in some form or other. This is often internal relationships within an organisation, but also comes into supplier, customer or even investor relationships. Setting a context for discussion in which people feel anonymised, can act as a way to remove these barriers. This creates unexpected insight and outcomes that might be hidden from us in everyday life. OneTeamGov — a group of game-changers from within the Civil Service — are passionate about the opportunities presented by removing hierarchy to drive change. Read all about them here and how they facilitate their ‘unconferences’, bringing people from every level of government working together to solve problems. The way that Chatham House enforces the rule is simple — it’s a spoken agreement within the room at the beginning of an event. There is a high level of trust, partly enabled by their membership model. At the other end of the spectrum, one of Culturevist's host organisations asked participants to sign an NDA on arrival. This is an interesting approach that builds an exciting connection between people in the room and creates a talking point in itself. It might leave participants feeling less confident to share content and learnings, however. OneTeamGov’s approach falls somewhere in the middle of these two with their ‘unconference’ setup. They lay down a set of rules at the beginning of a session that give everyone an understanding of the value of breaking down barriers and collaborating openly. In the spirit of sharing and collaboration they’ve released their slides — see how they work here. The key is ensuring you start with the right group of people. Whether you’re approaching a design sprint or a conference, ensuring participants are an engaged group attending for the right reasons will give you a great head start. Agree or disagree — I’d love to hear your thoughts! Get in touch via email: imo@thinkplanthrive.com. Imo is a partner at Think Plan Thrive. We support entrepreneurs in startups and large companies to grow ideas from strong foundations - even in the most challenging of environments.